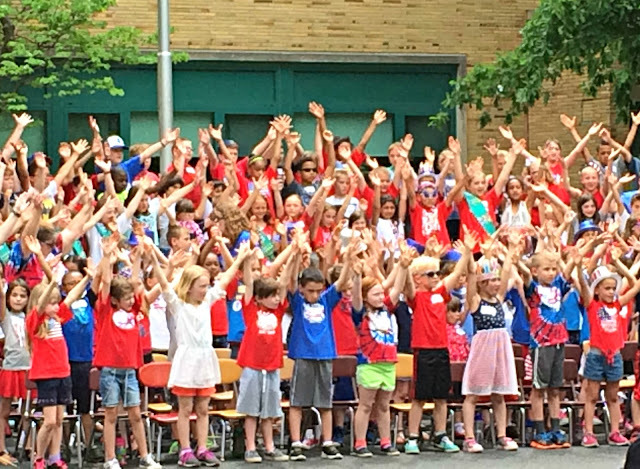 Celebrating RED, WHITE & BLUE DAY during the Memorial Day Weekend is a decade's long tradition at my children's elementary school which entails an outdoor patriotic parade and concert featuring all the students. With all that time being spend outdoors, we didn't want sunburn to put a damper on the fun and exciting atmosphere of this day. So we used Australian Gold to help keep the sunburns away. Wear sunscreen and apply it properly. Apply sunscreen 30 minutes before going outdoors to provide plenty of time for it to be absorbed by a child's skin. Make sure to apply sunscreen even on cloudy days because ultraviolet rays are still shining even if the sun isn't bright in the sky. Use SPF (Sun Protection Factor) 15 or greater and don't miss easily forgotten spots like the nose, ears,and behind the neck. 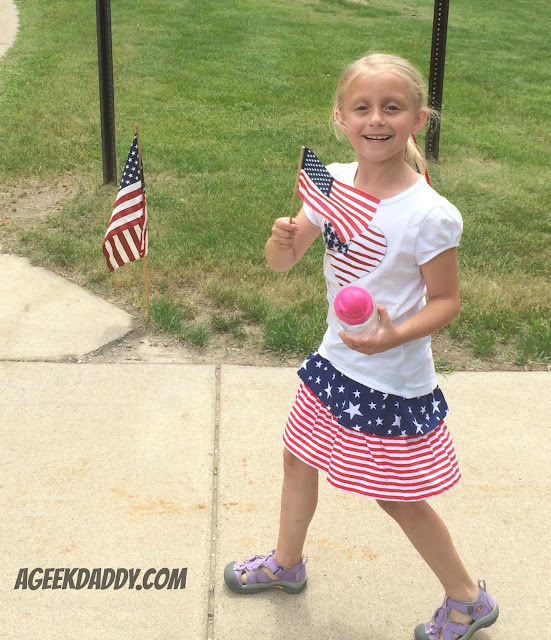 When wearing sandals, or no shoes at all, don't forget those toes! Reapply every 3 hours or sooner if a child gets wet or sweaty. Don't forget your lips & eyes. Lips and eye balls can get sunburned just like any other part of your body. Apply lip balm that has SPF protection and wear sunglasses that will reduce UV exposure to corneas if spending an extended period of time outside. Medications can increase sunburns. Some prescriptions have a side effect of increasing skin sensitivity to the sun with antibiotics and acne medications being two often cited examples. When getting a prescription filled ask a physician or pharmacist if this is a possibility with the medication to be aware and help avoid a child being at risk from sun exposure. Best protection is clothing and a hat. Sunscreen is helpful but remember the best protection from UV rays is by wearing brimmed hats, clothing, shoes and sunglasses. Beware though that wet, light-colored clothing can allow the absorption of just as much UV radiation into your body as exposed bare skin would. Set a good example! If children witness adults wearing sunscreen they are more likely to follow that behavior. Ensure that skin protection is a priority for every member of the family. My daughter often complains and tries to get out of wearing sunscreen. With her blond hair and light complexion wearing sunscreen isn't up for debate so we've had several occasions where we've been delayed and late getting place while we deal with her resistance to putting it on. Australian Gold's Hello Kitty line of sun protection and skin care products have really helped us with her being more amenable to putting sunscreen on. 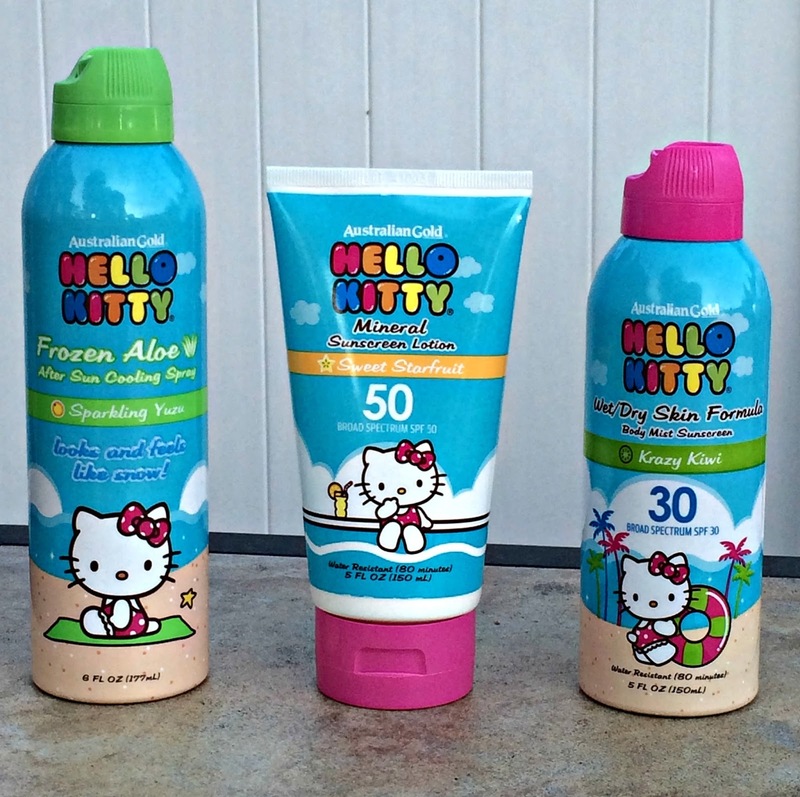 Australian Gold HELLO KITTY products include SPF 50 Mineral Sunscreen Lotion, SPF 30 Body Mist Sunscreen Spray, SPF 30 Lip Balm, and Frozen Aloe After Sun Cooling Spray. They provide colorful character focused packaging that kids can relate to making their application less intimidating plus ingredients that really work to get the job done in warding off those harmful UV rays. 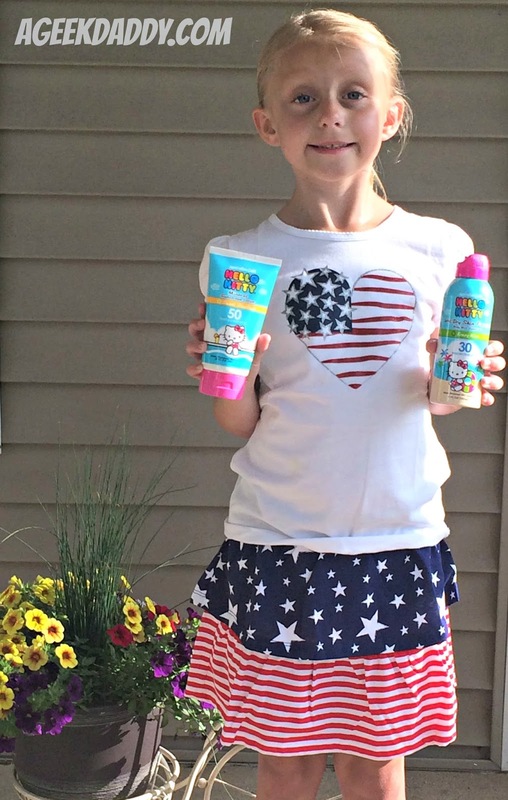 Have a safe and fun summer by making sure your kids are wearing their sunscreen!